Bonné is the outsider who breached the walls, as he describes in his opening pages. Though he carefully avoids comparisons to Washington or Oregon viticulture in the body of the text, he does note that his wine-writing career began in the Pacific Northwest. These wines clearly set the stage for his dive into the wines of California. In chapter after chapter, the trends and tribulations he writes about as challenges for California winemakers have already been tackled, and often solved, up here in the frozen north. "From the moment I arrived, I had to confront my own deep skepticism about California's winemaking reality. Again and again I was disappointed by what I found to be the shortfalls of California wine: a ubiquity of oaky, uninspired bottles and a presumption that bigger was indeed better." A marvelous history chapter deftly moves through all the high and low points of California winemaking in the last century – Prohibition, the Judgement of Paris, fighting varietals, the impact of Parker, phylloxera, the rise of the cult wineries, and what Bonné terms "the Reign of Flavor." "Which was worse?" he asks rhetorically. "The notion that California winemakers were apathetic about terroir, or that they believed in a sort of macro-terroir – California as defined by a blend of ripeness and hubris?" Having framed his thesis with this historical perspective, Bonné moves into the meat of the book – an exploration of the people, vineyards and wines that are doing a complete re-set on what makes great California wine. It's beautifully researched and written, pulling off the difficult trick of relaying detailed technical information without becoming tedious or geeky. One small example is the discussion about irrigation versus dry-farming, which includes some of the latest techniques and the suggestion, backed by research, that over-watering is endemic. It's a passage that ought to be read by every grower in Washington. Bonné argues persuasively that "it's hard to use Europe as a benchmark [for viticultural practices], not only because of difference in laltitude, but also because of different rain patterns, peak harvest temperatures, and particularly the extended late-season summer that California enjoys well into October." But the European model, and goal of all great wineries – the expression of specific terroir through the vehicle of wine – is always at the forefront of his thinking. And though European wine styles point the way back toward moderation, it is the wines of Washington and Oregon (my thought – not Jon's) that provide a better compass for California. To sum up, this is a most thoughtful, provocative, and ultimately uplifting book. I believe it is a hugely important milestone as well, as California vintners adjust to 21st century realities. Definitely a must-read for anyone who loves wine. I recently had a 1997 Turley Zin that was so incredibly delicious and thrilling to drink that I realized most of the wine I consume is sadly not at that level. Shame on me! 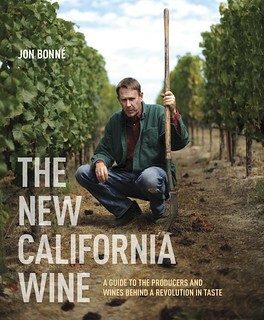 Then Bonne's book came out and I find myself re-energized and excited about the wineries he profiles and the work being done in the vineyards in some pretty off-the-map parts of California. Since reading the book. I too am fascinated with the idea that we might be able to dry farm vines here in the Walla Walla Valley. I know at least one vineyard that is dry-farmed and its fruit goes at a premium. I have begun tackling the topic with some vineyard people I know, and they maintain, we can't do it here. After reading this book, I'm not so sure they are right. Great review of a great book. I just finished it and found very little with which I disagreed. Some passages made me want to shout "amen!". He hits the nail on the head and the ball out of the park with the courage to tell it like it is. I hope this book accelerates the style pendulum in the direction that its beginning to swing. The pendulum has been swinging back more toward the old-world style for several years now, so hopefully this book will accelerate that trend. While I agree that the pendulum has begun swinging back in the other direction, I hope that this doesn't result in another homogeneous winemaking trend: a bunch of careful-not-to-do-too-much wines that don't have enough personality to be differentiated from one another. I think there's a place for all styles of winemaking. WWG – I was struck by the same thought. According to Bonné, annual precip as low as 8 inches may potentially be dry-farmable. It's a topic that needs a lot more work here in Washington. Kevin and David - thanks for the words of support!. Brandon, I don't believe wines can get more homogeneous than they are already. Nor do I worry that artisanal boutiques will suddenly opt for mimicking the mass-produced stuff. It's not a matter of doing nothing - it's more a question of knowing what not to do, and also when it's time to do something differently.